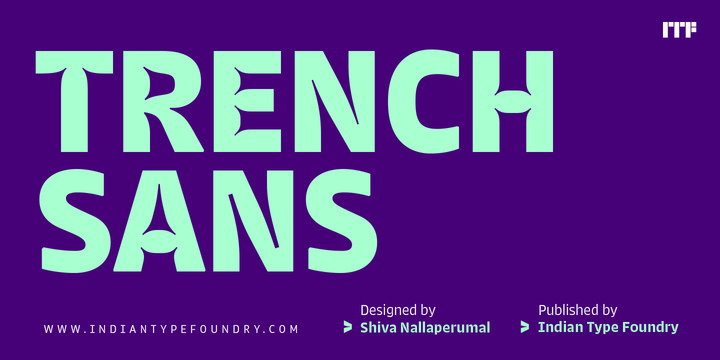 Trench Sans is a typeface created by Shiva Nalleperumal and published by Indian Type Foundry and is part of Trench family along with Trench Round & Trench Slab. It is available in 5 weights (from Light to Bold), alternates characters for display sizes and agata type (an unit of typographical measure). The Trench family has low descenders for setting lines with tight leading. It can be use in small sized texts, logo, newspaper, newsprint etc. Price: starting from $39 for one font to $130 for all 5 fonts. A font description published on Wednesday, April 13th, 2016 in Fonts, Indian Type Foundry, Shiva Nalleperumal by Alexandra that has 2,158 views.